Telkom Kenya is the east African telecom service provider that provides 2G, 3G and 4G LTE services. In this post, i have listed out all Telkom Kenya monthly data plans with 30days validity. In addition, i also listed their activation codes, prices, configuration settings including their network coverage. There are other plans, including Weekend and Night plans, as well as daily plans. You can dial *544# to access other Telkom Kenya data plans. Other data plans includes daily, weekly and 90-day validity data plans. Normally, Telkom should automatically configure your smartphone with the right settings, but on the off chance you didn't receive the settings, you can alternatively sms a blank message to 1234. Moreso, you can manually set up your APN settings with the below settings. Then save this APN settings. Select it as your preferred APN and you are good to go. Those are the settings that you need to be able to use Telkom Kenya on your smartphone. Telkom Kenya has 4G LTE coverage in Nairobi and Mombassa, with the rest of the country covered with 3G and 2G networks. That's all you need to know about Telkom Kenya and their data plans. Please share this post with friends and don't forget to drop a comment below. 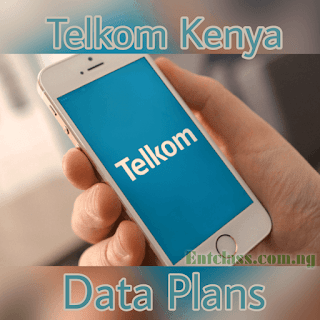 Telkom Kenya data plans, price, activation code, validity, configuration settings, internet settings. Telkom Kenya list of data plans, prices, code and validity. We should show them love too and update them. But Victor, how may Kenyans dey here? Seriously. Yet to see a post from one. OK, but is it working in Nigeria? This is good for Kenya people. Good development from kenya but they also try and remember we nigerians over here. I don't think any Kenyan is seeing this.. Abi Kenyan Traffic dey for your stats? ?